The first step in Pittsburgh to generating your own power and becoming Energy Independent is to reach maximum energy efficiency. Conservation is almost always the best investment and should be the first consideration. There are many established methods of renewable energy generation. Some are better in some areas than others. In today’s market, solar renewable energy generation pays for itself in 7-10 years. The key is to find the ‘right’ solution for your needs and combine it with the best incentive program to make it cost effective. Careful consideration needs to be given to the type of energy you produce. Click here for our Energy Audit Section to learn more. Some are high maintenance, others have insurance implications. A system needs to be looked at objectively and weighted with all negatives and positives before being implemented. EIS can assist in all aspects of renewable energy from site and system assessment to determine the best system for your needs to the planning and funding through installation and ongoing maintenance concerns. Solar energy can be harvested by using Photovoltaic(PV) to generate electricity or Solar Thermal which uses the suns heat to produce hot water. Solar electric system carry 25 year warrantees and production guarantees and Solar Thermal has become so common and reliable that the state of Hawaii has mandated every home have a Solar Hot Water system. The most common question I hear is ‘Does Solar really work in PA?’ The answer is a resounding YES. PA has more sun per square meter than Germany who is the largest producer of Solar power in the world today and similar sun per square meter to San Francisco where thousands of arrays have been performing for years. Solar is a better investment in the desert where it is sunny all day and there are few clouds and no snow. But this does not make it a bad investment to build Solar in PA. Shade: Solar needs sunlight and lots of it. If your home is shaded by trees, hills or a neighbor’s home, it may be difficult to generate enough power to make the array a worthwhile investment. Even a little shade on the corner of an array can make a significant impact on the overall production of the array. It is important to get a full assessment of your home using a Solmetric Suneye or other similar tools to help determine a true ROI for you. Roof Orientation: True South (which is different from magnetic south) is the best of course. But south east and south west arrays work nearly as well. As you get further from True South, your production will decrease. An array oriented directly East or West will generate about 85% as much energy as one facing True South. As long as this is factored into your ROI accurately and the array still pays for itself quickly enough for you then there is no problem. We have had great results with arrays facing east and west. Keep in mind, if your home does have an east or west roof, you should take shading impacts even more seriously. The loss of an additional 5% of sunlight due to shade can have major effects on your ROI and even disqualify you for grants and other incentives. Roof Pitch: The Ideal array in the Pittsburgh area should be oriented at True South and pitched 30 degrees. Different slopes will lower output slightly. Steep roofs can increase installation costs and make ongoing maintenance and cleaning more difficult. Lower sloped roof are much easier to access for cleaning and maintenance. 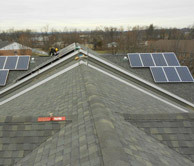 Roofing Type: You are mounting a solar array to your roof that will last 30 plus years. You must ensure the roof is in good shape when the panels go on and each attachment point should be sealed in a way that will outlast the panels or you will be removing them to fix leaks. - Normal shingles are the preferred roof type to mount on because they are easy to seal. It is extremely important the penetration points be flashed. EIS flashes every penetration but most companies do not due to the added labor and material costs. Failure to flash penetrations will likely cause you to remove the panels inside of this lifetime to patch your roof. Make sure it is built right the first time. - If you have a slate or tile roof, the cost of installation can be much higher than a shingle roof. Slate has a tendency to give way when it is disturbed and patching slate can be very expensive. - Lap Seam Metal roofing has many penetration points form its own installation. This type of roof lasts a long time but due to the penetration’s, has a tendency to leak. Adding more penetration’s will increase this chance of leakage. This type of roof cannot be flashed but there are some good methods to ensure the roof maintains its integrity. - Standing Seam Metal roofs are great for solar. The solar can be mounted without the need for penetrations. - Flat Roofs are excellent for solar. Panels and racking systems can be held down by their own weight using ballast blocks which allows the entire array to be installed without the need to penetrate the roof membrane. Mounting Types: Roof or ground? - Roofs are the obvious area for mounting solar but ground arrays will outperform roof mounted arrays and though they are somewhat more expensive to construct, they often pay for themselves more quickly. If you find your roof is unsuitable for solar, perhaps the yard will be a better choice. - When an array is mounted on the roof it should be mounted with 2-4 inches of clearance between the panel and the roof to allow a natural convective loop of heat to pull heat off the array and bring cooler ambient air under the panels. This cools both the array and the roof itself extending the life of the shingles and keeping the building cooler in the summer time. The cooler a panel is the better it produces. A roof can reach 300+ degrees in the summer. High temps can actually shut down a solar array. Designer Black panels and panels attached directly to the roof surface operate at very high temperatures and will under produce panels that are mounted a few inches above the roof. Biomass is the most suitable renewable energy for Western PA. Biomass is any biodegradable product that can be safely burned or composted to produce energy. Examples are wood, leaves, grass, even trash. The two primary methods of extracting energy from biomass are incineration and bio digestion. These are very cost effective methods but are labor intensive and require a reliable supply of biomass to be effective. E.I.S. has been involved in the assessment, planning, design and grant writing for a number of Western PA Biomass and Biodiesel projects. Wind is an excellent source of energy. Under the right circumstances Wind can produce more energy than any of the alternatives. Wind is not without its issues. Wind has many moving parts and needs to be maintained. The turbine must be mounted very high which can cause liability issues and disrupts the skyline of your neighbors. Wind is unpredictable in PA due to the topography and unless you do a one year wind survey to find out what your typical wind speed is at your specific location, you will only be guessing at the ROI. Wind requires a large area unencumbered by wind obstruction, has enough land to fit your structure and has a local code that does not prohibit the noise generated and allows for the height of the structure being erected to support the turbine. This leaves wind generally in the Rural market. But the biggest issue we find in PA is that the clean energy rights of Wind are virtually worthless compared to Solar. We are happy to assess urban/suburban projects but have historically found them unsuitable. Our best advice is for you to first speak with your zoning office to determine if a Wind Turbine can be permitted in your location. Then call us and we will arrange an assessment. Geothermal is an excellent option for Western PA. Geothermal energy utilizes the grounds natural steady temperature to bring your coolant to a given level. Then this coolant is run through a heat pump system to remove the heat or cold depending on the need. Since geothermal heat pumps only move heat, they operate at a rated efficiency over 300%. They are the most inexpensive systems to operate but are sometimes cost prohibitive to install. Choose an installer wisely. Take a lot of time and due considerable due diligence before you hire them. Most systems that do not perform properly or do not last are due to inexperienced installers making errors or cutting corners. This is the most critical issue in geothermal.E.I.S. currently offers grant services for commercial geothermal systems. Micro-Hydro energy is created by using the natural movement of water as you would find in a river or tide. This is an excellent, low cost alternative energy but you must have the specific resource available to take advantage. You need a source of moving water and you must have some sort of significant drop to harness it in. If you have both of these, we would be happy to help you explore it. Hydrogen is most commonly produced by splitting water through a process called hydrolysis. One of the coolest things about burning it is the byproduct is water. Hydrogen is often overlooked due to the lack of commercialized technology. Currently it costs more in energy to produce hydrogen then you get by burning it. MIT recently discovered a cost effective method of splitting H from H2O. We arefollowing this development and will update information as this new technology becomes commercially available. Hydrogen has some great future potential in taking homes, farms and businesses off grid. Hydrogen can be burned in existing diesel engines with a 5-10% mix of diesel fuel. (see the current project and the University of North Dakota and the 2005 project at the University of Tasmania) Most renewable energy production is low voltage needs to use battery storage. This presents an issue when attempting to use high amperage equipment like welders. They will spike a battery and destroy or dramatically shorten the lifespan. In order to compensate for this solar or wind could generate hydrogen and the hydrogen could then fire a generator to overcome the power surges. I believe Hydrogen is the best solution long term for American energy independence but the technology is still ten years or more away. E.I.S. typically builds systems that pay for themselves in 7-10 years. Anyone who has an area suitable for Solar should have a solar array.